Catching up: Raise THE shot glass! – Go ask Alisa – DIY capsule wardrobe one stitch at a time! Catching up: Raise THE shot glass! Yellow, yellow everyone! No, today’s headline is not an invitation for a drink and not an encouragement to start your Monday morning with a hangover. I am simply willing to present you my humble shot glass collection from all over the world that finally arrived via post couple of days ago. Since I have moved, it seems like all my stuff is evenly layered between US, UK and Latvia and it takes a lot of effort to gather it all back together. 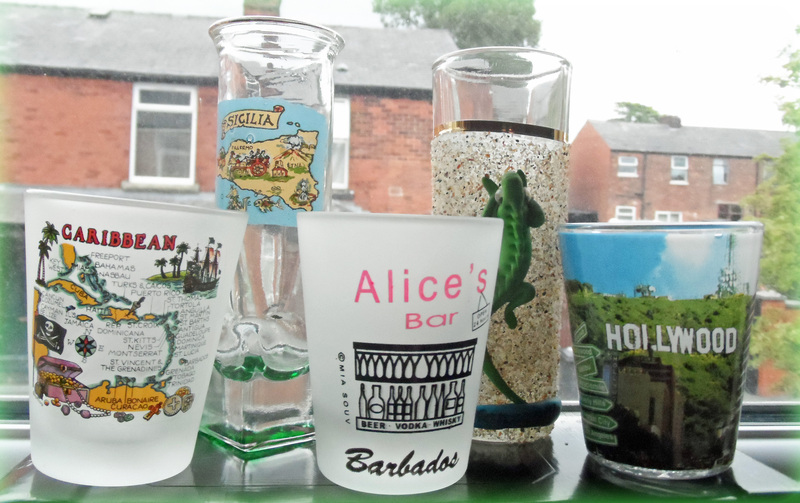 That’s only a part of my shot glass collection, but I am very proud to present these memorabilia brought from Hollywood, Sicilia, Caribbean, Barbados and Manzanillo! Everyone probably knows how very intolerant I am towards indecisive personalities. Well, too bad I could not decide at the very beginning what exactly am I collecting from the places I visit. The result is: magnets, shot glasses, jewelery, mini drinks samplers, earrings and even clothing brought from all over the world. Tell me, and what are you collecting? I know! Most souvenirs are overpriced, but then again – those are memories that are being kept forever. So I say – it is worth it! 😉 how much is it for a shot glass from Hard Rock? I think they were around $12 each for the basic logo versions. Plus another $30 for a T-shirt, of course. 🙂 But yes, I agree that it’s well worth the splurge! Sorry, I meant $9 for the basic logo one, $12 for the special designs. Still worth it! Previous Previous post: Dressing up: Rock your harem pants!